Published by: Hodder and Stoughton. Official synopsis: "It's been six weeks after angels of the apocalypse have destroyed the world as we know it. When enemy angels fly away with 17-year-old Penryn's little sister, Penryn is forced to team up with Raffe, an injured angel who wants his wings back. Together, they will journey to the heart of San Francisco and the angels' stronghold, where an unimaginable horror awaits them." I wasn't quite sure how I was going to feel about Angelfall when I sat down to start reading it. I'd had a copy on my Kindle for a little while but for some reason or another I just kept putting it off. I wasn't sure if I would like it. Yeah, angels of the apocalypse sounds epic, but would the book be epic itself? Would it live up to the hype that I was seeing on Twitter and across Goodreads, Amazon and the blogosphere? I'm happy to say that upon finishing the book I can confirm that it more than lives up to the hype. 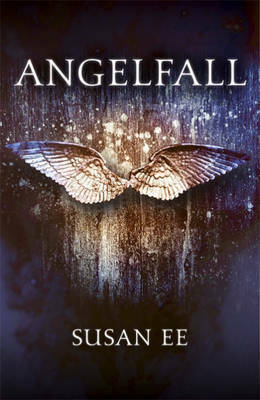 In fact, after reading Angelfall, I don't think the hype is big enough! While it's only a short book, around 280 pages, it packs an almighty punch that will have you glued to its pages and racing to see what happens next. Penryn is doing her best to keep her family together. Dad left years ago, and Mum has been battling mental illness for as long as Penryn can remember, but now thanks to there being no medication, no doctors, in fact no civilisation as we know it, it's getting worse and it's becoming more of a struggle. All the while, Penryn is caring for her little sister, Paige, who happens to be disabled so needs all the help she can get. The world as we know it is gone - Penryn has no idea what has survived and what has not, but she knows that the streets are not safe. With the loss of civilisation, laws are also gone - dangerous gangs prowl and are never far away, but the biggest danger comes from the sky. The angels. And when Paige is taken by an angel for reasons unknown she is determined to get her back if it is the last thing she does. It just so happens that an angel has just been attacked by other angels right in front of her and she now possesses his wings. She has a bargaining tool - she knows what she wants and the angel, the sickeningly beautiful Raffe, can help her. Honestly I am at a loss for words at how amazing this book it. It's so beautifully written and evocative that I couldn't stop reading even when I had to - damn you work! It's rare to read a book that is intoxicating that it is all you can think of. It leeches into everything - it's all you can thing about, awake or sleeping. Angelfall is one of those books. It's so full of danger, blood, anger, despair and lust. It has everything and then some. It's horrifying, shocking, sometimes making you feel sick, that unmistakable nervous feeling in the pit of your stomach makes an appearance every now and again only to recede and spring right back into place with the next chapter. Only one thing really bugged me about the book. And that is that we don't find out why the angels did it... Why they attacked. What it was for. But luckily, the angels don't know either! I guess that's a book two thing right? Please say so Susan because I can't wait till book three to see why... My sanity cannot take it! Susan Ee really has created something of a masterpiece. It truly is a flawless debut worth every bit of hype and then some! I am already dying to read book two. Thankfully it's out later this year! Argh! Thank you publishing gods for having mercy on us and not making us wait until next year! Once I started reading this I found it difficult to put down,and I picked it up again as soon as I could. This is a story about human looking angels with wings. Some good some bad but all very strong even though they look week. Great book. I thought I would "give it a try" and I ended up reading it in one day. Grabs you from the beginning. Susan Ee made her characters smart and real. No stupid teenage slang thrown in. Real thoughts and real conversations. Couldn't wait for the second one.